Shamefully, I never played the original Infinity Blade, instead hearing heaps of critical praise for it and thinking “…but I’m skint, and… it can’t be that good, can it?”. Having played the second Infinity Blade ($6.99), I now realise what a stupid mistake not buying the original was. For those wondering how the original game is improved upon in this sequel, I’ve been reassured by a friend that the easy answer is: in almost every way. The graphics are better; the combat system is deeper through different weapon types giving you different defensive abilities; the rate at which gold is acquired is better balanced, and so on. 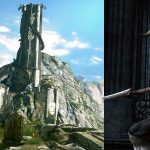 Because I haven’t played the original, and suspect that many people reading this review will be in the same situation, I’ll try to keep the rest of this review independent to ‘how Infinity Blade II is an improvement on the original’. All you need to know is that it is. In the game, you play the part of Siris, a character wrapped up in a confusing story that I didn’t really understand – after a good eight hours playing the game, all that I’ve got of the story so far is that you’re trying to save someone by fighting lots of scary looking enemies. After a brief tutorial section involving some beautiful trees and buildings, and a few of those threatening looking titans, you are thrown into the repetition-based game proper. The core of the game is based on your hacking your way through a sinister castle-temple-fortress-thing, until eventually dying through some misfortune or other. Then, you are reborn again at the entrance to the castle and have to fight your way through it again. And again. And again. Each time that you journey through the building, you discover new paths, uncover gold that’s hidden around the environments, and purchase more powerful items from the inventory. With each rebirth, your inventory and improved character abilities are reborn with you – quite handy, really. Of course, enemies also become stronger and more difficult to defeat, so if you don’t upgrade your items or character cunningly, you’ll find it harder and harder to progress. If the combat system was shoddy, the game would fail: aside from clicking on different pulsing dots to travel along different paths, and tapping on bags of gold, treasure chests or keys to nab their contents, all you do in the game is fight. Thankfully, the fighting is brilliant fun, though it does eventually get a little samey. To harm your enemy, you first have to defend against their attacks. If you do this well enough, they’ll show brief moments of vulnerability – attack breaks – in which you can happily swipe their health bar into oblivion. You have several defensive options open, being able to block, dodge, or parry. Parrying is possible with every weapon class, and is achieved by swiping in the opposite direction to your enemy’s attack. If you have a ‘heavy’ weapon like an axe equipped, you can only block or parry attacks. Splayed across the bottom of the screen are three buttons: one for blocking attacks from the left, one for central defense and a third for attacks that come from the right. Pressing the correct buttons as you’re attacked will keep you happy and healthy. Similarly, if you have a ‘dual’ weapon, you can only dodge attacks, according to the same three-button system as described above. Having ‘light’ weapons equipped gives you the best of both worlds: pressing the central button blocks, and you can dodge to the left or right. Each class of weapon has different characteristics – heavy weapons deal more damage but are unwieldy, whilst dual weapons are quicker but less damaging. Of course, there are some fun nuances to the combat system, like combo hits – more painful attacks that you occasionally unleash. After a period of building up its power, magic can be unleashed by drawing the appropriate symbol on the screen, often having devastating effects for the enemy. 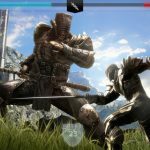 During some battles, you are also set XP challenges – finish the battle having, for example, parried 5 times, and you get some extra XP. The XP levelling up system works well. Each time you win a battle, you get XP points according to the difficulty of the enemy you’ve defeated. This XP is split across the five items you’ve got equipped from your inventory: your weapon, shield, magic ring, helmet and suit of armour. If one has already reached the maximum XP, you won’t be awarded any XP for that area – so overall, you’ll get less XP. That’s incentive to keep purchasing new weapons from the store, and thus to keep improving your character. When you reach enough XP to level up, or max out an item’s XP, you can choose to improve your health, attack, shield or magic. You can also improve these characteristics by decking your items out with jewels that you’ve found/purchased, provided the jewel is the right shape for the item. 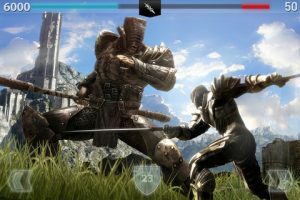 Of course, one of the things that really makes Infinity Blade II stand out are its stunning graphics, definitely the best that I’ve seen on the app store. Many of the stupidly large enemies that you face are a particular highlight – each is a work of art in itself. It’s a shame that you do spend a lot of the time travelling through environments you’ve been through before, though one effect of this is that when you uncover new areas, their beauty is even more obvious. It’s surprisingly fun admiring the scenery in this game. The music is also beautiful. It never intrudes on the game experience, instead building its atmosphere expertly. Sadly, the same can’t be said for sound effects during battles: the sound of swords clashing can get monotonous after a while, and could do with toning down a little. As in most app store games, the voice acting is also pretty rubbish. Overall, Infinity Blade II is a brilliantly crafted game with a compelling fighting mechanic. Plus, the ability to listen to your own music whilst playing meant that I could clash swords while listening to Take That, which was an oddly satisfying combination.You’ll have easily won back the cost of the game in the six or seven hours of gameplay before enemy attack patterns become stale, or the sound effects begin to grate. That said, it might take a little less time than that for you to get fed up seeing a cut-scene of your enemy backflipping away from you – there tends to be one every few fights, and it only really looks cool the first few times. If you’re looking for a not-at-all-casual, fairly challenging game, I strongly recommend that you buy Infinity Blade II, and buy it now. It’s brilliant. Sadly I didn’t, but I’m sure I will now that you’ve given me the idea. En garde, Barlow. great score! glad to hear the hype is warranted.